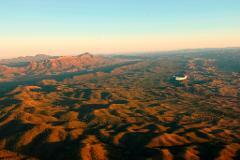 20 minute scenic flight over the Wilpena Pound amphitheater and the Ikara-Flinders Ranges. Requires minimum 2 passengers to depart. 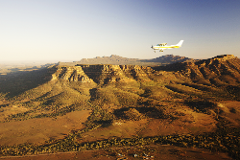 30 minute scenic flight over the Wilpena Pound amphitheater, and takes you slightly further out over the Ikara-Flinders Ranges. Requires minimum 2 passengers to depart. 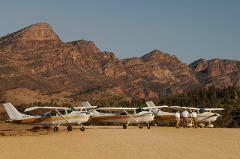 1 hour extensive scenic flight over the Wilpena Pound amphitheater and the surrounding Ikara-Flinders Ranges. Requires minimum 2 passengers to depart. A birds eye view of outback South Australia sarting with a scenic flight over Wilpena Pound and Brachina Gorge and on to Lake Eyre. Requires minimum 2 passengers to depart. 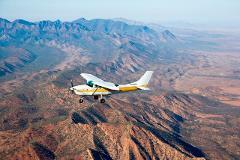 A birds eye view of outback South Australia starting with a scenic flight over Wilpena Pound, the Flinders Ranges and on to Lake Eyre, via the remote town of William Creek. Requires minimum 2 passengers to depart. 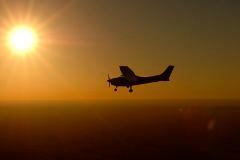 A birds eye view of outback South Australia starting with a scenic flight over Wilpena Pound, the Flinders Ranges and on to Lake Eyre, via William Creek, and over Maree, and Muloorina Station. Requires minimum 2 passengers to depart. A birds eye view of outback South Australia starting with a scenic flight over Wilpena Pound, the Flinders Ranges and over to Arkaroola for the Ridge Top 4WD tour. Requires minimum 2 passengers to depart.